Why do traders love simple trading strategies? The simplest day trading strategy is also the most flexible. Hence, a simple day trading strategy is a useful starting point for any day trader. There are many simple day trading strategies including the simple trend bar failure strategy and the simple strategy using Bollinger Bands. These strategies are simple and easy to follow. However, these might not be the best day trading strategy for you given your trading style. Why not create your own simple day trading strategy? Create your own simple day trading strategy with the following template. Allows you to include your favorite tools. This is a basic template for trading intraday trends. First, find the trend. Keep it simple and choose only one trend-following tool to help you. Now, wait for the trend to slow down and retrace before trading it. Jumping on a car while it is speeding can get you to your destination. It’s just a little challenging to find ways to do it without getting hurt. It’s the same for trading trends. We can hop on the trend while it is blazing away. The problem is with setting stop-loss orders to protect us. This is not a problem if you are trading a long-term trend. However, day traders’ have limited profit potential within the day. Hence, we need precise stop-loss points to support our positive expectancy. Define what is a retracement within the trend. For instance, in the Holy Grail trading strategy, a retracement is when prices fall back to the moving average in a bull trend. Remember our aim. Choose only one tool to help you with defining the retracement. If you can use the same tool you chose in first step, then you are a champion minimalist trader. A day trading strategy is never complete without specific entry and exit rules. You must know exactly when to enter a position and when to exit so that you can act without hesitation. These specific rules also help to define our reward-to-risk ratio for each trade. To keep things simple, do not add another indicator. Use the indicators you have chosen from the earlier steps. This is a 3-minute chart of CL futures (Crude Oil on NYMEX). 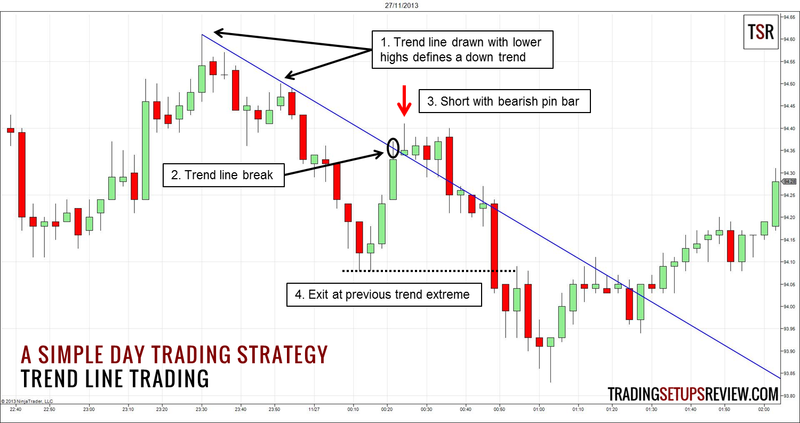 We use trend lines to connect swing points to define a trend. We need a trend line break before we start looking for continuation trades. We enter with a pin bar. We exit at the earlier extreme of the trend. We used only one trading tool which is the trend line. No trading indicators. A simple price pattern for entry and a previous resistance for exit. When I started day trading, I added so many indicators to a point where it was confusing. I started only using the fewest but more efficient. Your tips helped a lot. That’s right. Once you get used to the simplicity of a few or no indicators, you’ll not look back. Thanks for your comment! How to trade better and consistent entry and exit point. There is no one size fits all rule for this. The main principle to attain consistency is to focus on process over profits. Easy Understanding and exit at the best point. Thanks! Exiting at the most recent trend extreme is the most conservative exit strategy for a pullback trade. You can check out more ideas for taking profit in this article.